Garlicky plantain soup is a favorite in southern Ecuador—and maybe soon in your house, too! Bonus: Our version takes about 35 minutes to make. Bring water to boil in large saucepan. Add plantains; cover. Cook 15 min. Drain plantains, reserving 1-1/4 qt. (5 cups) of the cooking water. Cut plantains into 2-inch chunks; place in food processor or blender container. Add garlic and the reserved cooking water; cover. Process until smooth. Return plantain mixture to saucepan. Add milk and salt; mix well. Bring to boil, stirring frequently to prevent burning. Reduce heat to low. 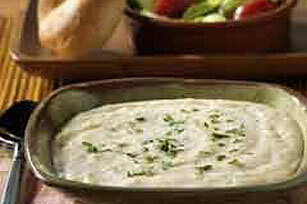 Add cheese and sour cream; cook until cheese is completely melted and mixture is well blended, stirring frequently. Sprinkle with the cilantro. Serve with a mixed green salad and a whole wheat roll. This soup is a favorite in southern Ecuador, where it is often made with less milk and served with rice. Be sure to use a non-aluminum pot or spoon when preparing this soup since the aluminum utensils can cause the soup to discolor. Makes 8 servings, 1 cup each.